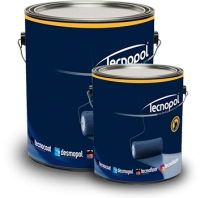 DESMOPOL DW is a two component liquid made up from 100% solids aromatic polyurethane, which once catalyzed forms a continuous elastic membrane, without any joints, overlapping or any integrated mesh needs. Its properties make it an excellent choice for achieving air-tightness and perfect waterproofing. It is applied manually, using a roller or brush.